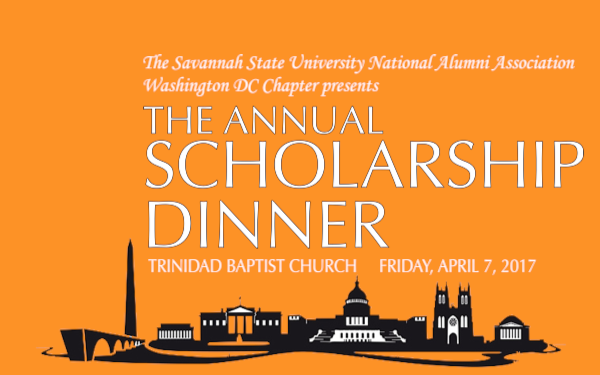 WASHINGTON — The Savannah State University National Alumni Association Washington DC Chapter will host its annual Scholarship Dinner from 11 a.m. to 4 p.m. on Friday, April 7 at the Trinidad Baptist Church in Northeast. Proceeds from the dinner will go to the District of Columbia Alumni Chapter of Savannah State University National Alumni Association Scholarship Award which provides financial assistance to attend Savannah State University to deserving, graduating high school seniors and college students residing in the Metro-Washington, DC area. Members of the SSUNAA DC Chapter do all of the cooking and preparation for the dinners which will consist of a choice of fried fish, baked or fried chicken, or barbecue spare ribs, and two side dishes. The available side dishes will include string beans, cabbage, greens, potato salad, candied yams, macaroni and cheese or cornbread. A dessert will be included with each meal. The cost will be $10 per dinner and carry out orders will be available by calling (202) 396-3532 on the day of the event.